Hey, food trucks! The application deadline for SouthBites Trailer Park is fast approaching! If you want to bring your food truck and its fantastic fare to SXSW 2018, then you must apply by the deadline, October 15. The SouthBites Trailer Park is always a hit with SXSW attendees. 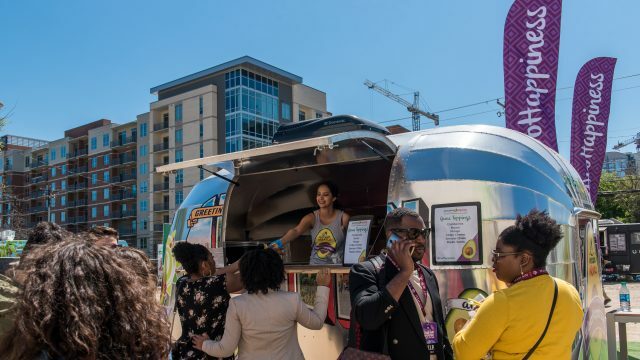 Last year, thousands of hungry conference- and festival-goers headed to the Trailer Park daily where 14 food trucks offered up a collection of cuisine that included tacos, fried chicken and waffles, lobster, empanadas, tamales, noodles, and more. This year, the Trailer Park will expand to feature live performances by official Showcasing Artists at the first ever SouthBites Trailer Park Stage. So don’t miss your chance to share your delicious food with thousands of attendees while being a part of SXSW 2018! To learn more about this opportunity and be considered for a spot on the lot, fill out the SouthBites Vendor Application Form. The post Final Call for SouthBites Trailer Park Applications appeared first on SXSW.